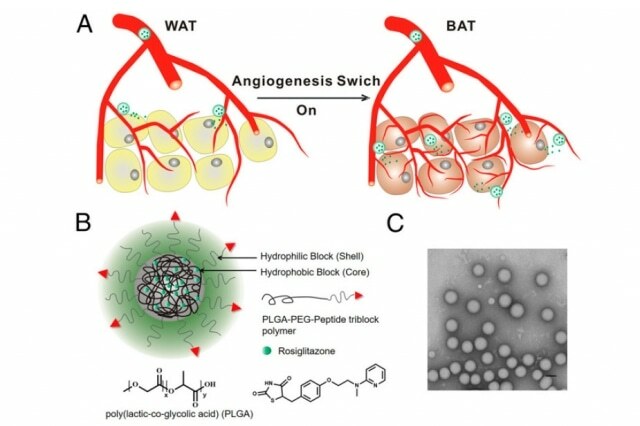 Fat-fighting nanoparticles that are capable of directly delivering anti-obesity drugs to fat tissues have been recently developed by scientists at MIT and Brigham and Women’s Hospital. When the research team used these nanoparticles to treat overweight mice, the animals lost 10% of their body weight over a period of 25 days and did not show any sign of adverse side effects. The anti-obesity drugs work by converting white adipose tissue into brown adipose tissue; the former contains fat-storing cells, while the latter is capable of burning fat. In addition, the drugs trigger the growth of new blood vessels in the adipose tissue, positively strengthening the nanoparticle targeting and assisting in the transformation of white adipose tissue into brown adipose tissue. These anti-obesity drugs are not new in the field, but they have not been approved by FDA. However, the researchers devised a novel technique to deliver these drugs so that they can build up in fatty tissues and prevent any undesirable side effects in various parts of the body. The advantage here is now you have a way of targeting it to a particular area and not giving the body systemic effects. You can get the positive effects that you’d want in terms of antiobesity but not the negative ones that sometimes occur. Over one-third of Americans are considered to be obese. Last year, this medical condition surpassed smoking as the leading preventable cause of cancer death in the US - causing 20% of the 600,000 cancer deaths. The senior authors of the study are Langer and Omid Farokhzad, director of the Laboratory of Nanomedicine and Biomaterials at Brigham and Women’s Hospital. The results of the study have been published in the Proceedings of the National Academy of Sciences. The lead authors of the paper are former BWH postdoc Xiaoyang Xu and former MIT postdoc Yuan Xue. Earlier, Langer and his research team had demonstrated that if new blood vessels are stimulated, a process called angiogenesis, adipose tissue can be effectively transformed, and this would result in weight loss in mice. Conversely, drugs that cause angiogenesis can adversely affect other parts of the body. In order to resolve this issue, Farokhzad and Langer explored the nanoparticle drug-delivery strategy, which they recently developed to treat various diseases, including cancer. By targeting the nanoparticles to the disease site, a powerful dose of drugs can be delivered, while reducing the accumulation of the drug in other areas of the body. The particles designed by the team have the ability to transport the drugs in their hydrophobic cores, which are adhered to a polymer called PLGA. This polymer is utilized in many medical devices and other drug delivery particles. Two different drugs were integrated inside the particles: rosiglitazone, which has been approved for treating diabetes, but it is not extensively utilized due to negative side effects, and an analog of prostaglandin. Both drugs stimulate a cellular receptor called PPAR, which triggers angiogenesis and the subsequent transformation of adipose tissues. The nanoparticles’ outer shell includes PEG, another polymer integrated with targeting molecules, which direct the nanoparticles to the exact location. These targeting molecules adhere to proteins, which are present in the blood vessel lining surrounding the adipose tissue. The particles were tested in mice, which were fed a high-fat diet to make them obese. Over time, the mice lost roughly 10% of their body weight, and their triglyceride and cholesterol levels also reduced considerably. The animals were also more responsive to insulin. Obesity results in insulin insensitivity, which increases the risk for type 2 diabetes. No side effects were seen in the mice from the point of treatment, which was administered every other day over a period of 25 days. This is a very exciting and clinically important contribution, grounded in the recognition of the significant and growing need for new therapeutic approaches for the treatment of obesity. The authors convincingly demonstrate that by coupling the selective transformation of adipose tissue from an energy storage status to an energy expenditure status with the stimulation of angiogenesis, one can effectively reduce obesity in vivo. Farokhzad explained that the particles were intravenously administered using the existing system, making this method effective for patients who are morbidly obese and are at increased risk for obesity-related diseases. For it to be more broadly applicable for treatment of obesity, we have to come up with easier ways to administer these targeted nanoparticles, such as orally. Nanoparticles cannot be delivered orally because it is not easy for them to enter the intestine lining. However, in an earlier study, Farokhzad and Langer produced a nanoparticle that was coated with antibodies and these antibodies adhere to receptors present on the surfaces of cells lining the intestines. This enables the nanoparticles to be absorbed via the digestive tract. In order to promote the transport of nanoparticles across the intestine, the team recently devised another orally delivered nanoparticle, which uses a protein called transferring. This protein plays a role in the transport of iron in different parts of the body. The team is hoping to discover adipose tissue targets that are more for the nanoparticles, which could reduce the chance of adverse side effects. The researchers also intend to explore other types of drugs that have lower toxicity levels. This is a proof-of-concept approach for selectively targeting the white adipose tissue and ‘browning it’ to allow the body to burn fat. The technology could then be used with other drug molecules that may be developed or other targets that may come up. The National Institutes of Health and a Koch-Prostate Cancer Foundation Award in Nanotherapeutics funded the study.